Visitors to Devon and Exmoor are always keen to spot the many wild ponies that roam the hillsides – and we’re very lucky here at the Two Moors Festival HQ, with lots of the horses to be found in the immediate area. We always see them as we drive to Dulverton or on our way to Minehead on the hill before the bridge at Landacre, and it was around this part of the Devon countryside on Dunkery commons that Monsieur Chapeau – arguably one of the most famous Exmoor ponies of recent times – was found, orphaned and suffering from pneumonia. He was taken to Holt Ball Exmoor Pony Stud after he was discovered and is now well on his way to recovery – his story capturing the imagination of the internet and his blog, run by owner of the Exmoor Pony Club Dawn Westcott, getting over 23,000 hits as people watch him get back on his hooves. “The Dunkery Commons are breathtakingly beautiful but consists of some of the most varied and challenging terrain in Exmoor National Park. While the area offers an incredible environment for wild ponies to roam, it also contains the inevitable harshness that means not all ponies are able to survive, such as orphaned colts who may evade the round up by hiding in nooks and crannies,” Dawn says. If you would like to get involved and support the Moorland Exmoor Foal Project with sponsorship, fund raising help, volunteer help or to offer a moorland foal a good home then please contact Nick and Dawn Westcott on 01643 862785 or email marketing@equinetourism.co.uk. We here at the Two Moors Festival have lived in Devon for the last 20 years or so and have to say that, even after all this time, seeing the free-roaming Exmoor ponies roaming the countryside never gets boring, which is why we’re so pleased here that the Heart of Exmoor scheme is about to hold the first Exmoor Pony Festival. With the help of Heritage Lottery Funding, the event – due to take place between August 27th and September 2nd – will include an Exmoor pony ride organised by the Exmoor Pony Society, a horse agility demonstration, photography safaris, an afternoon on a moorland farm and a talk by expert Sue Baker, among other activities. The ponies have lived in Britain since the last Ice Age thaw – around 10,000 years ago – and are direct descendants of wild European horses known to be in the country 130,000 years ago. 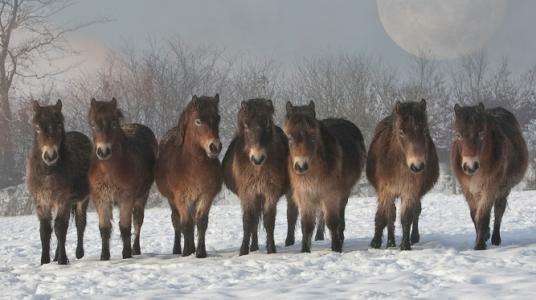 If any animal deserves a festival, it’s certainly the Exmoor ponies! For further information, have a look at the festival blog, find the organisers on Facebook or follow them on Twitter.